RAW HOLLYWOOD : GUCCI MANE TEAMS UP WITH YOUNG THUG FOR "GUWOP HOME"
GUCCI MANE TEAMS UP WITH YOUNG THUG FOR "GUWOP HOME"
Ever since Gucci Mane has been home, he has been consistently dropping new music. The rapper is definitely playing catch up and I'm sure Gucci fans are not complaining. 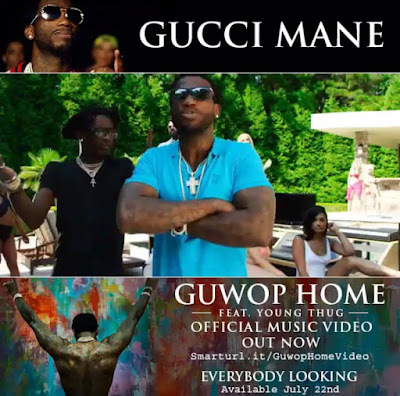 Today he dropped his newest song and video titled "Guwop Home" featuring fellow rapper Young Thug. Of course this song will featured on his mixtape Everybody Looking, which is set to drop on July 22nd. The track of is produced by none other than Zaytoven and Mike WiLL Made It and its looking like it may be a summer hit. "Guwop Home" video takes place at a pool party with lots of banging bodied eye candy to partake in as you watch. Gucci is also reminding the fans that he is still the King of Trap in this song too. Are you ready for the new Gucci mixtape? Have you been feeling his new music thus far? Check out the video below! GUWOP HOME!!! !